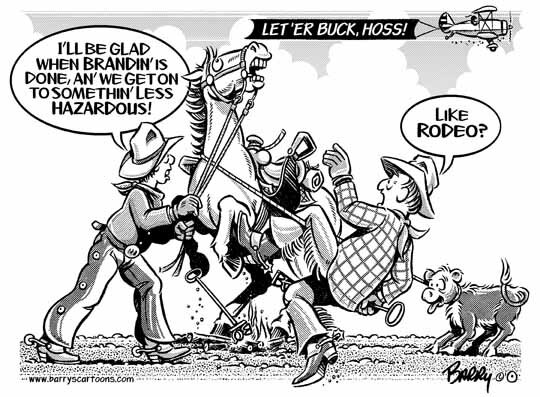 This AG cartoon is serving double duty: It's a timely tie-in with cattle branding, plus it foreshadows the beginning of RODEO season — which just happens to start in May with the Buckin' Horse Sale in Miles City MT, where rodeo producers show up each year to view the new crop of buckers. I've gotta admit there's usually more horsing around going on in the grandstand than in the arena — which probably is no surprise to you, eh? HA! I'll be creating a separate RODEO Category soon.